This is absolutely one anime you do not want to miss out on. If you are a fan of Dragon Ball Z, Bleach, One Piece, and Naruto, then this is a MUST WATCH. The story starts out a little weird, but eventually the characters will grow on you and their world starts to make a lot more sense. This is my all-time favorite Anime! I've watched plenty of top quality animes, and Fairy Tail will always rank in the top ten of my favorites. Fairy Tail is a long running anime that never leaves you disappointed. The story takes place in the region of Fiore. In this area people use magic for everything. The story revolves around the people in the guild, Fairy Tail. 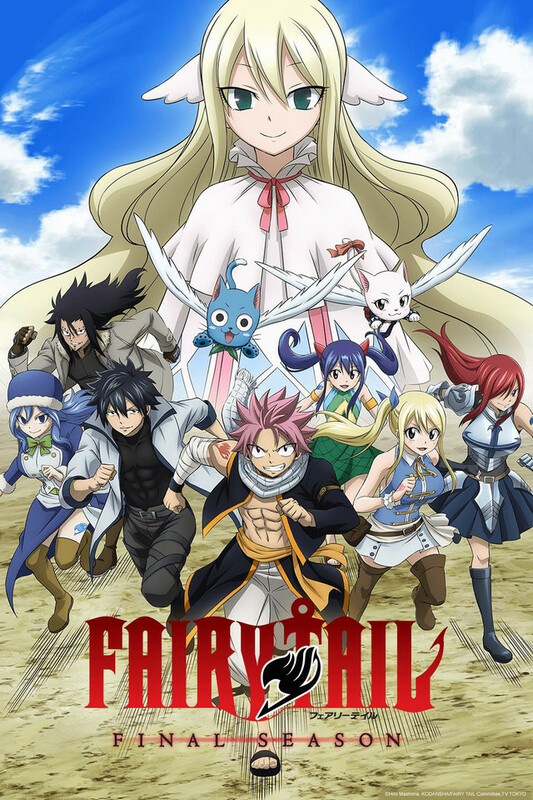 Primarily it focuses on Lucy Heartifilia, Natsu Dragneel, Gray Fullbuster, and Erza Scarlet. Later, other characters are introduced or become more important, but I'm focusing on the original four. The protagonist is Natsu, when he was a child he was taken in and raised by a dragon, Igneel, and taught how to use Fire Dragon Slayer magic. This allows him to manifest flames from his body and beat you to death if you piss him off or hurt his friends. He can be silly at times and quite fierce when upset. He's not the protagonist that cries and runs off when times get tough. He fights and never gives up, even if that means he could die. Lucy is the leading female protagonist. She plays a bit under the stereotypical damsel in distress role, but she can defend herself against weaker (or stupider) opponents. She is typically a product of fanservice, usually against her will. She has the ability to summon Celestial Beings to fight for her because she has made a contract with them. At the start of the show she is not very strong at all, but she becomes stronger over the course of time. (Example: Before she could not call out more than one Celestial Being at a time, nor switch between them. Eventually she can switch between several and she can have two out at the same time.) Gray Fullbuster is an Ice Make wizard; so basically he can create weapons out of ice and fight with them. He has a lot of back story that ties in with the main plot and one of my favorite characters. He has a fierce rivalry with Natsu, and a bad habit of stripping all of his clothes off unconsciously. Erza is described as the most powerful female in Fairy Tail (the guild that is), and has a very stern personality. She had a past of being enslaved, and having to labor for, worshippers of Zeref, an ancient wizard capable of the most powerful types of evil. She usually puts Natsu and Gray in their place when they fight. The music is very fitting and powerful. I recommend looking up a few of the songs. You won't be disappointed. The animation was very good even before they smooth it out for the continuation. As I can see from the preview it looks better than most movie animations. Fanservice is very obvious in this show, and there is practically cleavage in every episode. Some people say it is excessive, even to the point of annoying, but I say that it is just a part of the show and I have no complaints. There is a balanced amount of comedy and comedic foils in the show so you're not over-tensed by the plotline. Character development is amazing for some characters and a little lacking for others. Overall, I says you will get your fair share of feels, laughs, cries, and fanservice. I absolutely recommend watching this. If you haven't already, you should look around for the previous episodes; hopefully Crunchyroll will pick them up eventually. This review is meant for the mature crowd. Those of you whom appreciate over the top slapstick tropes, plot devices and the like will not see the sense in this review. Fairy Tail is at best a mediocre anime. It provides for a very repetitive and formulaic format for every story arc. Tropes, cliches, and plot devices are mercilessly used in this anime. Every time the protagonists encounter resistance they are quickly and easily dispatched as the enemy just leaves them for dead or whatever. The protagonists just moan a little, lick their wounds, and rebound through some plot device or cliche. Even the impressively powerful guild master somehow experiences defeat at the beginning of every confrontation only to recover and return later if his brood has not managed to succeed without him. Every adult character in this anime has a serious lack of maturity. Senior members of the guild are regularly out of the picture as the junior members do most to almost all of the heavy lifting. At first the senior members only appear to make trouble for their own guild, where they are whipped into shape by their subordinates. This anime has a very incongruous way of dealing with the protagonists powers and abilities. For some reason they are not considered S-Class Wizards despite repeatedly confronting and overcoming several other S-Class Wizards, quests, and guild leaders. Any powers that are learned or displayed near the end of a story arc are forgotten or weakened again at the beginning of the next where they return to being simpleton protagonists with something to prove. Any Protagonist with a weakness, like Natsu's motion sickness, is overplayed to painful slapstick extremes. Despite what appears to be limited and formulaic poorly developed story elements, Fair Tail still seems to be able to deliver surprisingly touching moments and some level of satisfaction as they pull through their predicaments. Attack on Titan, Hunter x Hunter, and Log Horizon are superior animes in nearly every respect when compared to this one. Before you fan boys down vote this instantly because I gave 3 stars, please consider reading before you ACTUALLY vote this. I've watched a lot of episodes and I'm glad they're back but it gets boring after awhile. "Oh we will never be able to defeat them"
"Oh no! I can't let Lucy, fairy tail etc. down!" "I have to beat them! But they are too strong"
"maybe If we bond together we can beat them!" "We Beat them with the power of Friendship and bond!" "Oh No a threat appeared...time to repeat process.."
and so on and so on, its fun for awhile but it gets boring and repetitive. Fairy Tail Series 1 review a must watch! I watched the 1st series of this show and i fell in love il be honest the Plot isn't the greatest thing you will see, the Arcs are not the best BUT the feel of this show just gives you the most amazing feeling! This is mostly because of how subversive the world of Fairy Tail is, plus the music! the music is incredible! if you are a fan of good feeling anime THIS IS A MUST WATCH! For this series the animation has increased 10 fold, the overall show just looks darker and grittier and that is what this show needed! one of my personal favourite anime! WATCH IT NOW!